Pictured above is Fairmount’s original building on our current Farm Crest campus to the east of Cat’s Back Road. 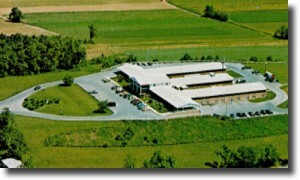 Fairmount Rest Home, as Fairmount was originally named, opened on February 19, 1968, with 20 residents. Of these, 16 were from New Holland Nursing Home. Their director, Florence Hoober, moved with them to become Fairmount’s first director of nursing. At the time, Fairmount was governed by an 11-member Board of Directors. On opening day, 42 rooms and 82 Skilled Nursing beds were available. By the end of February, there were 39 residents, 60 by the end of March, and 71 by the end of July. As of June, 48 full- and part-time staff were employed. 1970: Plans for expansion began. 1971: The number of skilled beds had increased to 109. 1971: The Farm Crest Community Room opened for public use. 1980: The building of cottages began, with 8 cottage units completed by 1985. 1983: Resident capacity increased to 132, including Personal Care. 1994-1995: 4 cottage units were added. 1996-1997: Another 5 cottages were added on Nolt Drive. 1996: Wheat Ridge expansion began across Cat’s Back road. 1998: Wheat Ridge expansion was completed in January, increasing the capacity to 120 nursing beds, 36 Personal Care beds and 18 cottages. The Wheat Ridge complex also houses a chapel, dining facilities, activity room, and gift shop. 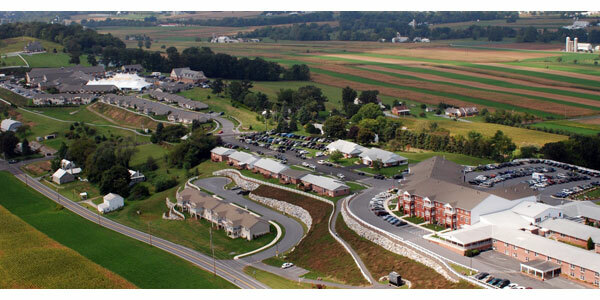 2004-2005: The Crest View apartment building, containing 49 units, was built on to the original Farm Crest building. 2012-2014: 6 new cottages were added on the Farm Crest campus. 2016-2017: 6 new cottages were added on Country View Drive. In September 1990, the first Community Barbecue was held. On April 20, 1992 the name changed to Fairmount Homes. In 1995, the first Perspective Newsletter was published. In mid-2005, the Farm Crest Community Room was renovated. Fairmount today consists of 50+ acres on two campuses divided by Cat’s Back Road. It is licensed for 114 Health Care and 74 Personal Care beds. Residential Living is comprised of 12 Residential Suites, 58 Apartments and 52 Cottages. Over 300 team members are employed. Above is an aerial view of Fairmount. Note the original Farm Crest building in the lower right corner.The Crest View apartments were built on to Farm Crest in 2004-2005. The Wheat Ridge complex is visible in the upper left corner, with cottages lining the streets adjoining the two campuses.